I guess that Alan Adler retired this year. Alan Adler was the man who ran the photo booth business in Melbourne for forty years. 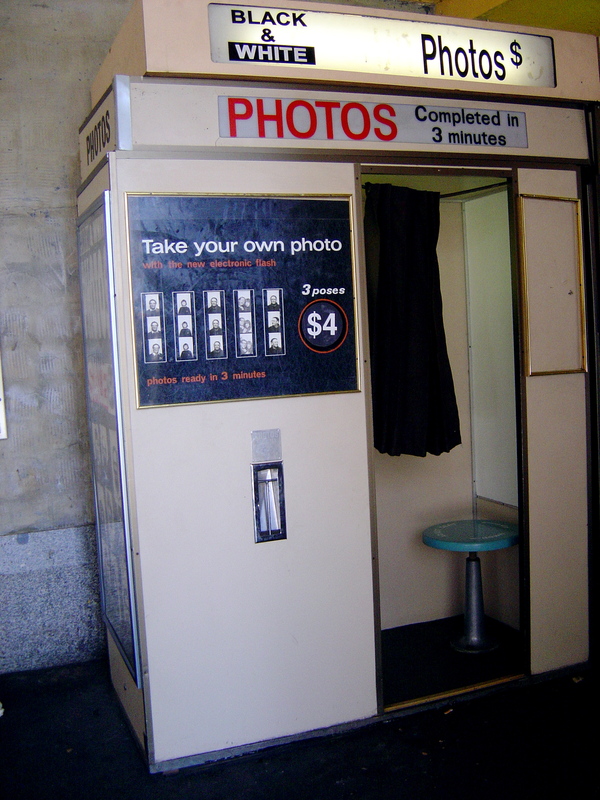 His analogue black and white photo booths are no longer at Flinders Street Station. In September 1925 in New York City on Broadway Anatol Josepho opened the first photo booth machine. (Näkki Goranin American Photo Booth (W.W. Norton & Company, 2008, New York). The photo booth was a common modern experience that inspired many people in the pre-digital world to play with portraying their identity. 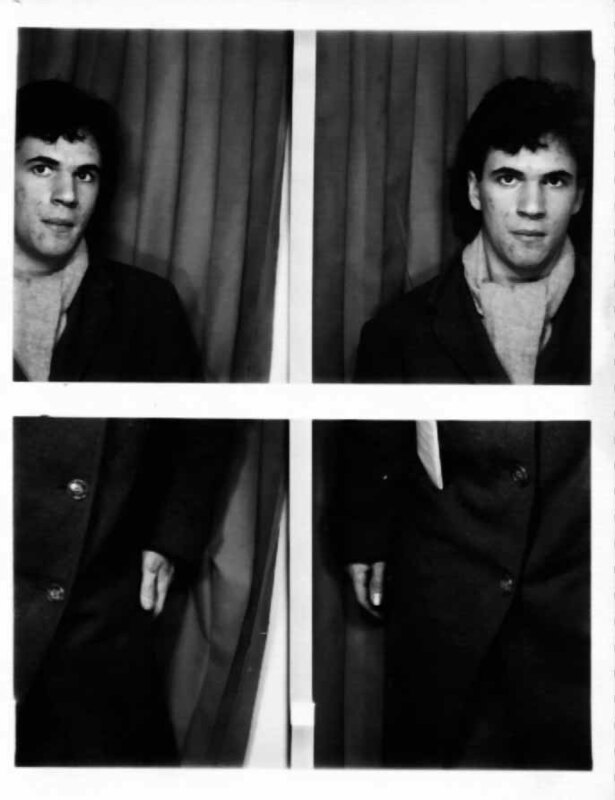 Since 1984 I have been working on a project using photo booth machines, documenting my life with a strip or two of black and white photos every year. It started fooling around in London; the machines were everywhere because a weekly tube pass required a photograph. I was aware of the history of art and photo booths: the Surrealists, Francis Bacon and Andy Warhol. Francis Bacon’s photo booth photos are reproduced in David Sylvester Interviews with Francis Bacon 1962-1979 (Oxford, 1980) (p.42). I delighted the strip format, like a comic book panels, in the limitations and the errors made by the mechanical processing. What you can and can’t control. Curtain or no curtain? How do you dress and position your body with in the confines of the small booth. The photo booth photo is always taken on the way to or from somewhere, it is a pause on a journey. You step out of the public space into a private booth, draw the curtain, insert your coins and pose for the photo before stepping out into public again to await the finished results three minutes later. I went to the photo booths at Flinders and Spencer Street Railway Stations to take photos on the way to friends, to Geelong, Bendigo. Now my project has come to its natural, or rather, technological end. Lindy Percival reported on Adler and his photo booth machines two years ago in The Age. 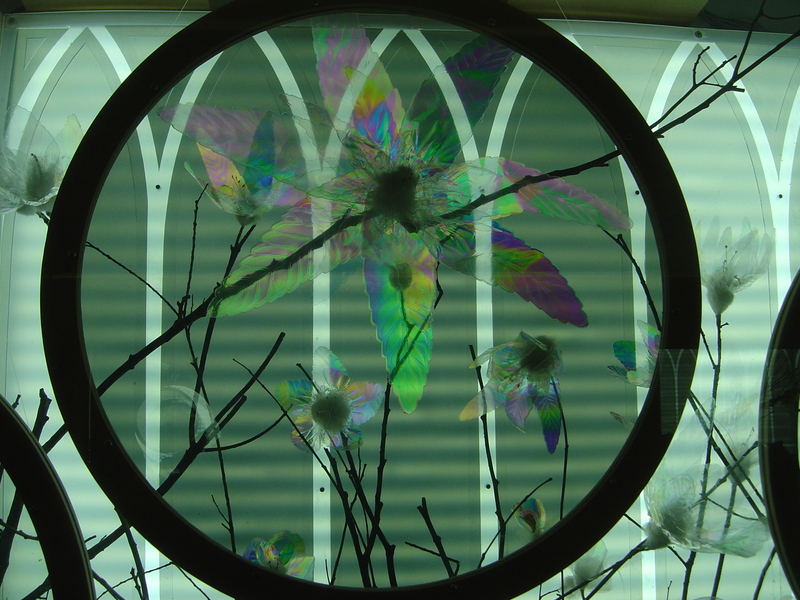 Local artist Marty Damhuis has a blog, flyingtale about his photo booth work; I wish that I’d seen his and Nadine Allen exhibition of photo booth photos at Platform in August 2009. See photobooth.net for more about photo booths including some of the artists who have used them. P.S. Actually the remaining black and white photo booth has simply moved a few metres further along Flinders Street station near the entrance to Platform 1. 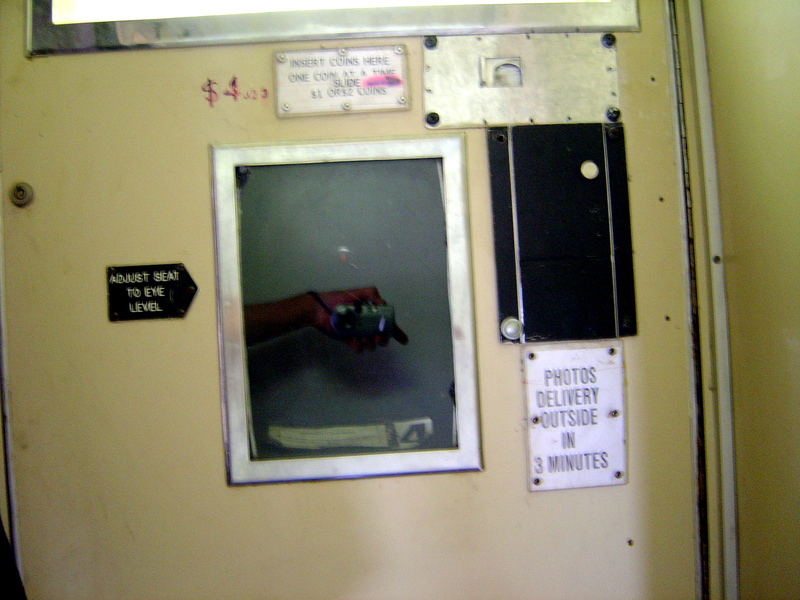 Interior of Photo Booth at Flinders Street. In researching public sculpture in Melbourne I am a little surprised to find orphan pieces; ‘orphan’ are pieces left out of the catalogue or a catalogued items with very little information. It is surprising that something as large as a sculpture is forgotten or lost in the records. But I’m only a little surprised it is not as if there is a catalogue of all the buildings, sculptures, fountains and things that are in Melbourne or any in any other city. Most of the statues owned by the City of Melbourne come with a brass plaque set into the pavement that states the sculptor, title and date. But this is not the case with privately owned sculpture on public display. 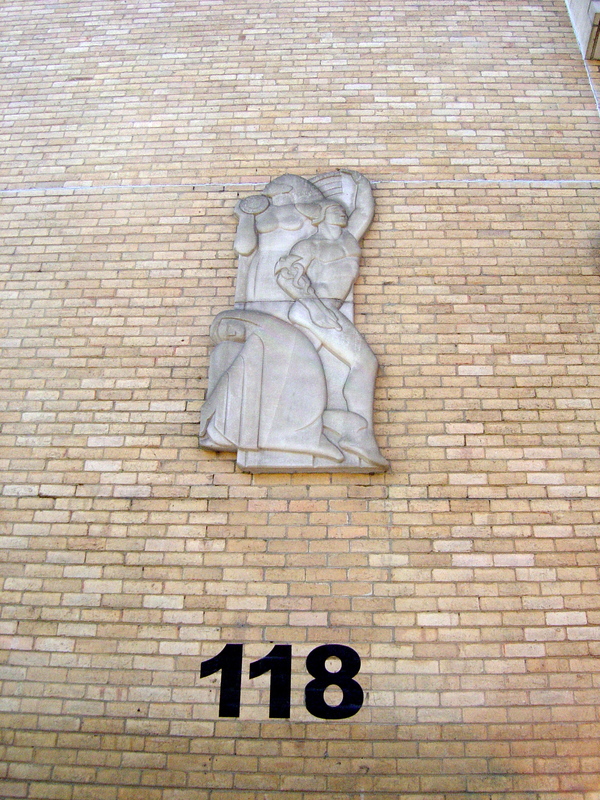 Many of these sculptural works were commissioned for private commercial buildings in Melbourne, like or the base relief on 118 Russell Street. The art deco figure of Mercury could indicate that it might have something to do with communications and would help date the piece. 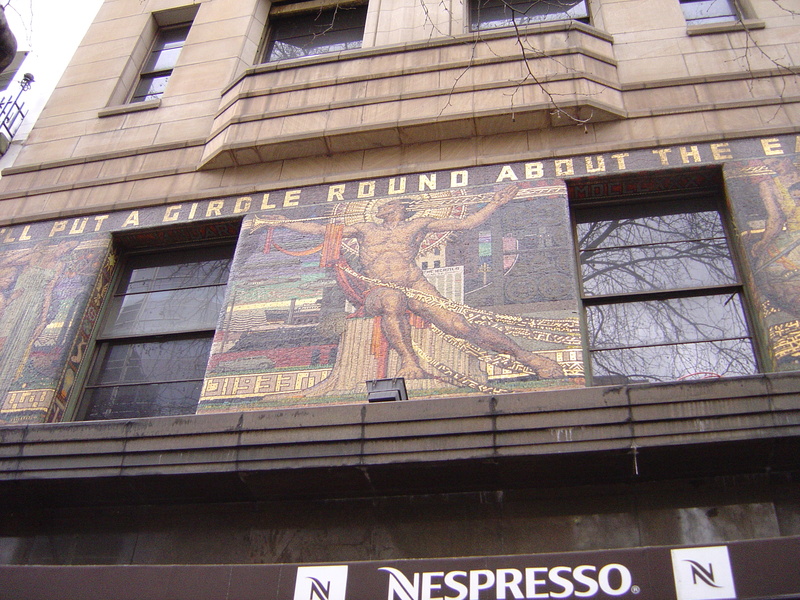 Likewise it is not known who made the many figures on the facades of Melbourne’s buildings, like the Atlas figure on the former Atlas Assurance Building on Collins Street, the Druid on the Druids Building on Swanston Street or the metal motif of a rather skeletal modern merman on the outside wall of the Port Phillip Arcade on Flinders Street. The rust covered corten steel sculpture out the front of The Domain (1 Albert Street) has been identified as Robert Jacks but there are more works of unknown or unidentified sculptors. Who made the three masted sailing-ship atop the weather vane that was installed c. 1919 at the Mission to Seamen. And who made the “French Fountain” a bronze fountain with granite plinth, from the International Exhibition of 1880 at the east entrance of the Exhibition Buildings? The stories of these pieces have been lost to history. These orphans need help – if anyone has any additional information on these sculptors could they please comment or contact me (melbourneartcritic at gmail dot com). 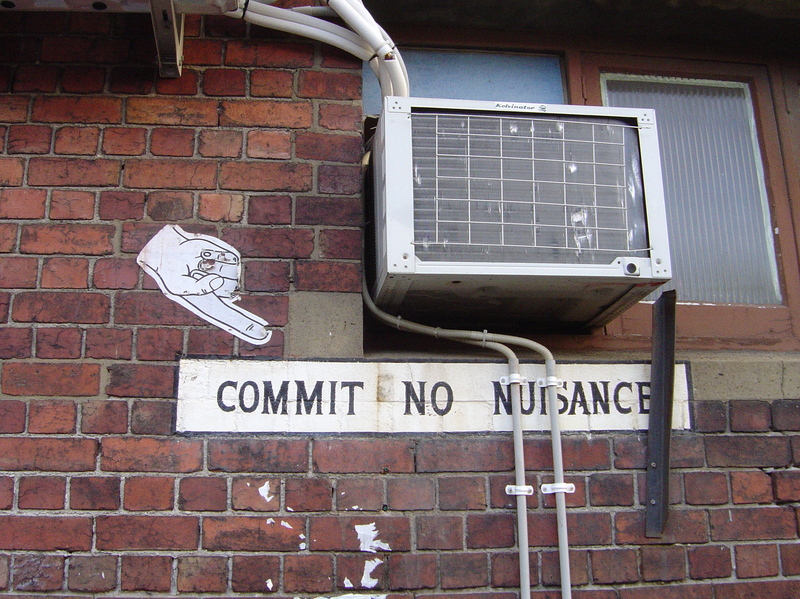 I’ve been keeping my eyes open on the look out for Melbourne’s street art. And I’ve been seeing street art everywhere. 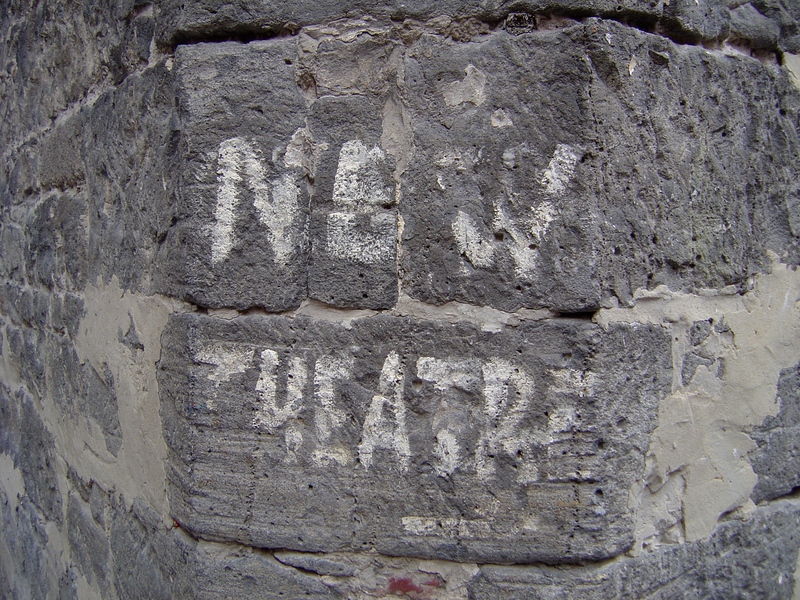 I’ve been looking in the usual places in the city and seeing it some unusual places. I saw some incidental tags and a Junky Projects in the photographs of Jesse Marlow on exhibition at Anna Pappas Gallery. Not that these tags are the focus of Marlow’s photographs but it would be hard to photograph the streets of Melbourne and not include some tags or a Junky Projects tin can face. “Don’t Just Tell Them, Show Them (Part 3)” by Jesse Marlow is a photographic exhibition that looks at the strange beauty found in urban details. Marlow’s photographs are beautifully composed images but she can’t control every detail of what she finds in the street. 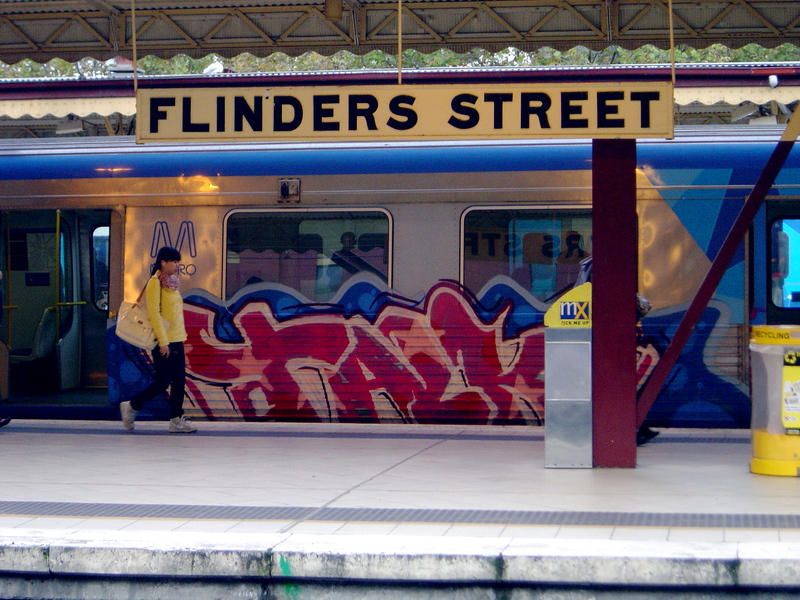 The first painted train carriage in Melbourne that I’ve seen in ages pulled into Flinders Street Station on Wednesday. I hurriedly pulled out my camera. It is not that unusual according to my contact in Metro. They must have been desperate for train carriages to fill the timetable. A contributing reason to why the carriage was run with graffiti might have been that the pieces didn’t cover up too much of the train’s windows. Mirka Mora’s broad brushstrokes and whimsical figures translate well into the medium of mosaic. Wall mosaics were once the popular media for public art in Melbourne and there are some that have aged well, for example, the Flinders Street Station Mural by Mirka Mora, 1986. The mural is on the inside wall at the Yarra river end of the station next to Clock’s Restaurant. The entire wall is not a mosaic, only the central panel is, the decorative upper frieze is painted and the lower border is painted with low-relief outlines. Tiled wall mosaics are expensive undertakings, in materials and time. A single artist cannot be completed a large mosaic without assistants. In creating the Flinders Street Station Mural Mirka Mora was assisted by Nicola McGann, who now works a Victorian company, Tactile Mosaics, and Brandon Scott McFadden, who currently lectures at Box Hill Institute. 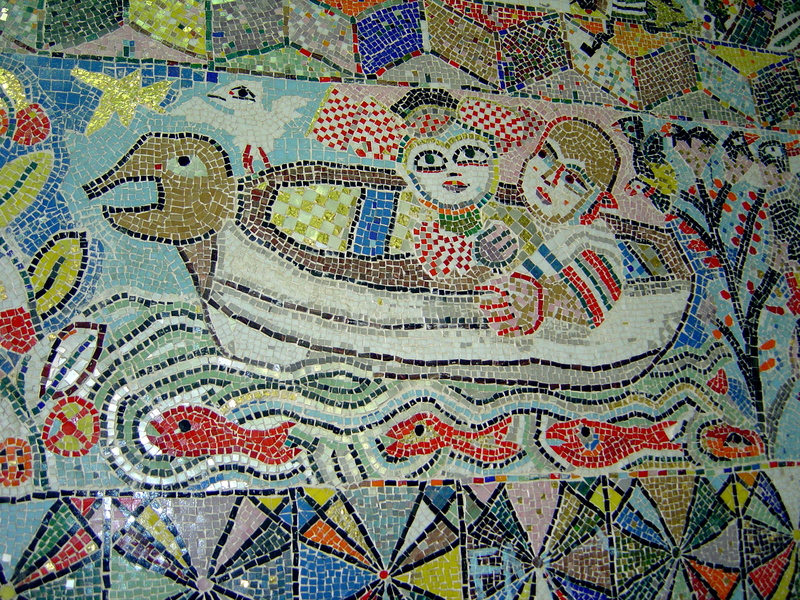 Mirka Mora also created a mosaic mural at St. Kilda Pier. 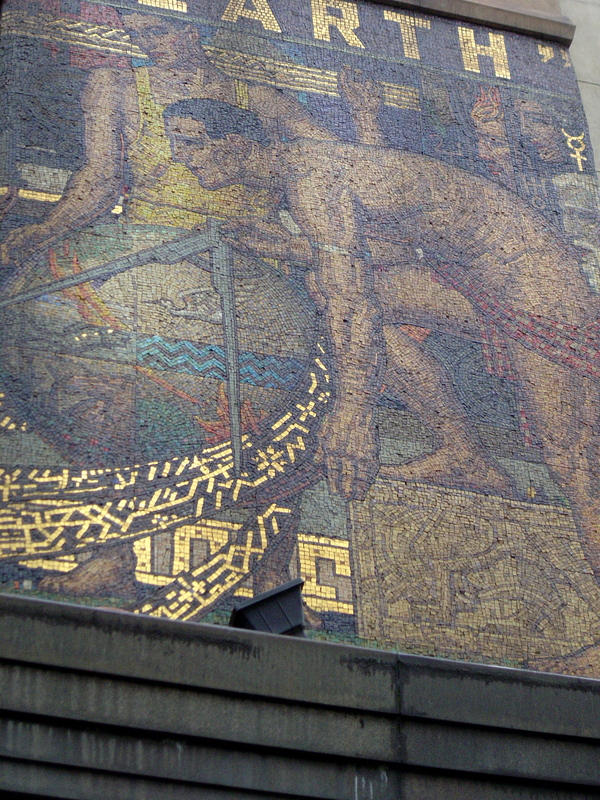 The bronze didactic plaque for the Flinders Street Station Mural refers to the two other major public mosaics in Melbourne: at Newspaper House and the East Hill Fire Station (see my post: The Legend of Harold Freedman). The Flinders Street Station Mural is a typical laughing response by Mirka Mora to the high seriousness of these earlier mosaics. 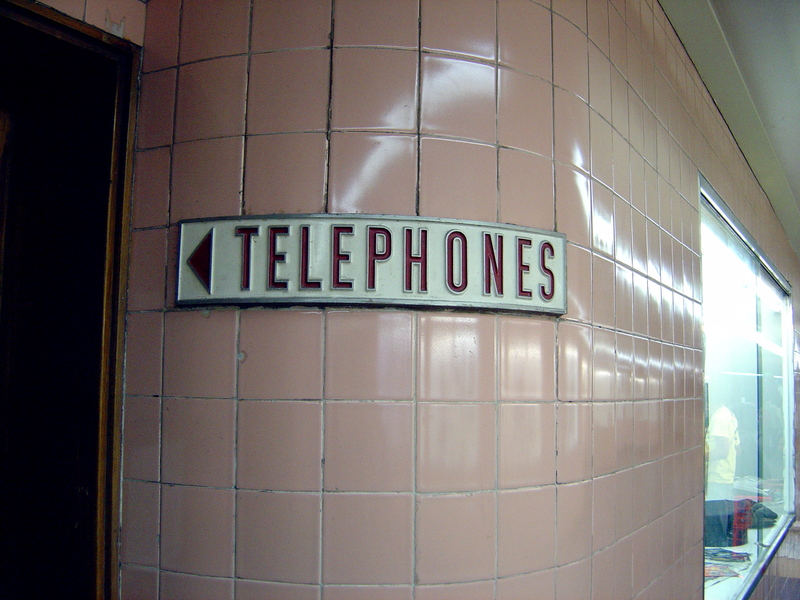 “Communication” by M. Napier Waller, 1933, is a large wall mosaic on the first floor of the front of Newspaper House in Collins Street. The slogan “I’ll put a girdle round the world” (Shakespeare, Midsummer Nights Dream) that runs across the top of the mosaic is a reference to the newspapers, The Herald & Weekly Times and not corsetry. Typical for the time the mosaic’s conservative late 19th Century style incorporates a few modern references including a car and train. A copy of newspaper The Herald is directly behind the central trumpet-blowing figure. Although mosaic was made in 1933 it bears the date 3 January 1840 in Roman numerals (“III January MDCCCXXXX) for the founding of The Herald. There are other murals and wall mosaics by Waller at the University of Melbourne and in Melbourne’s CBD including the mosaic “Prometheus”, 1967, Monash House foyer, William St, Melbourne. There are other buildings with less artistic and grand mosaics in Melbourne. Near the corner of Flinders and Elizabeth St. Flinders Arcade has is tiled façade. The tiles have the image of a golden sun that a metal skeletal figure of a crowned merman armed with a trident in front of it. There is a hard edge abstract mosaic on the side of the building on the corner of Elizabeth and Flinders St. in Melbourne, a faded folly of high modernism. Ceramic tile wall mosaics in Melbourne might appear to be a trivial topic in art history. 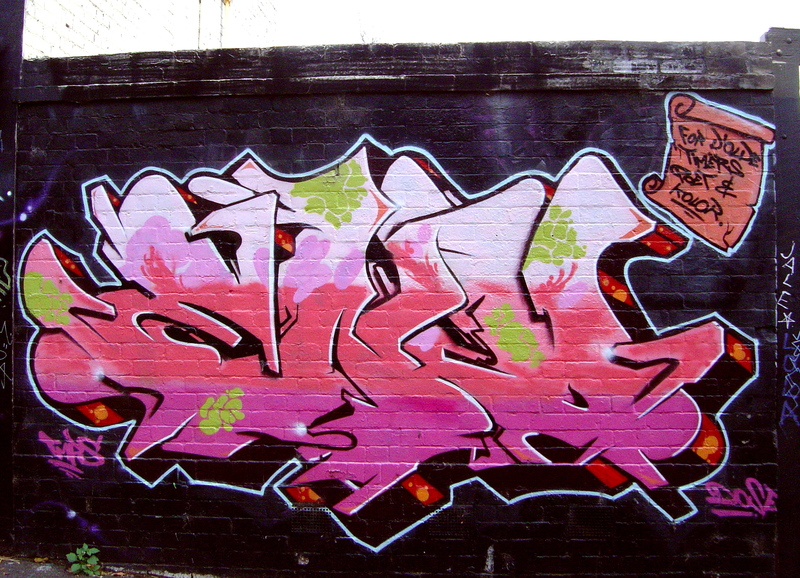 Most have dated badly, none of them are masterpieces but they draw attention to an ignored part of Melbourne. 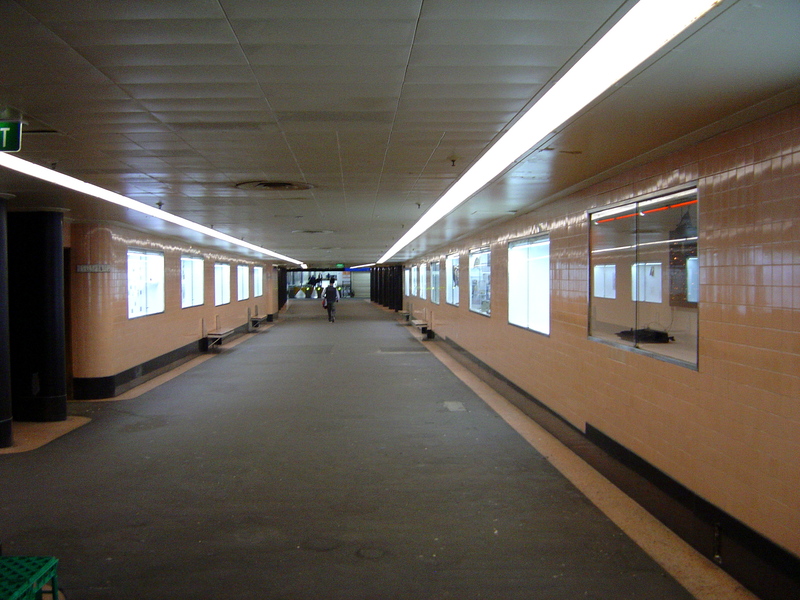 Melbourne used to have a lot more tiles. The outside and inside walls of Melbourne’s pubs were tiled, making it easy to wash the vomit off. 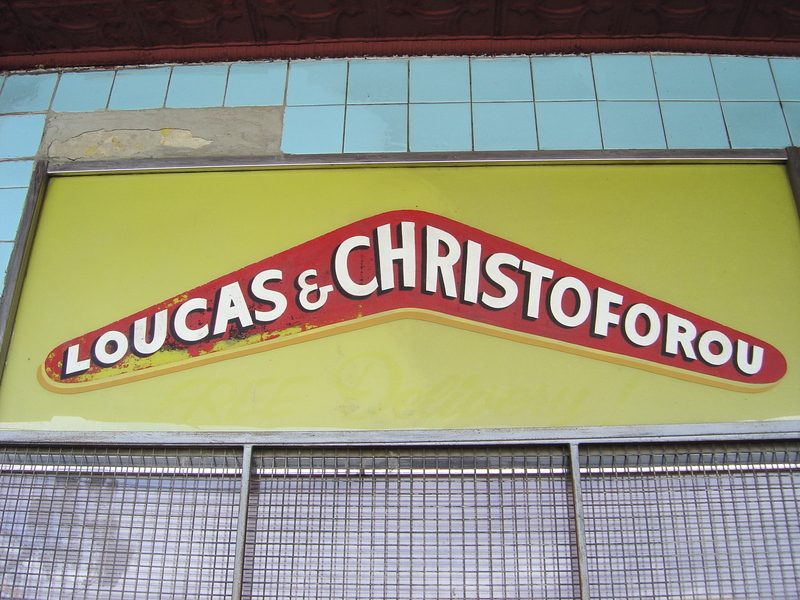 There were tiled mosaics sign for shops, still visible in some of the older shops, like the “Buckley and Nunn” sign above David Jones, as well as, higher up above the second floor windows. 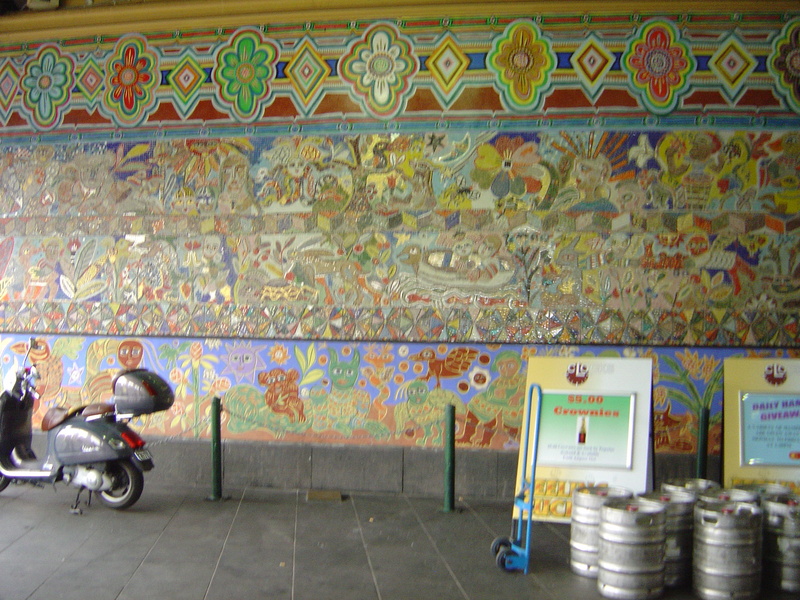 Although mosaics are durable they do require some maintenance – the Flinders Street Station Mural was restored in 1998. 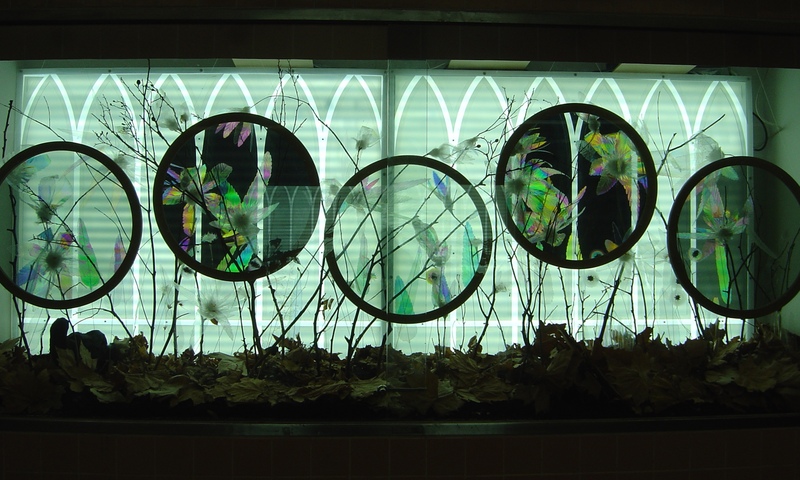 But due to their durability wall mosaics will continue in contemporary Melbourne public art such as Pamela Irving recent mosaics at Patterson Station.